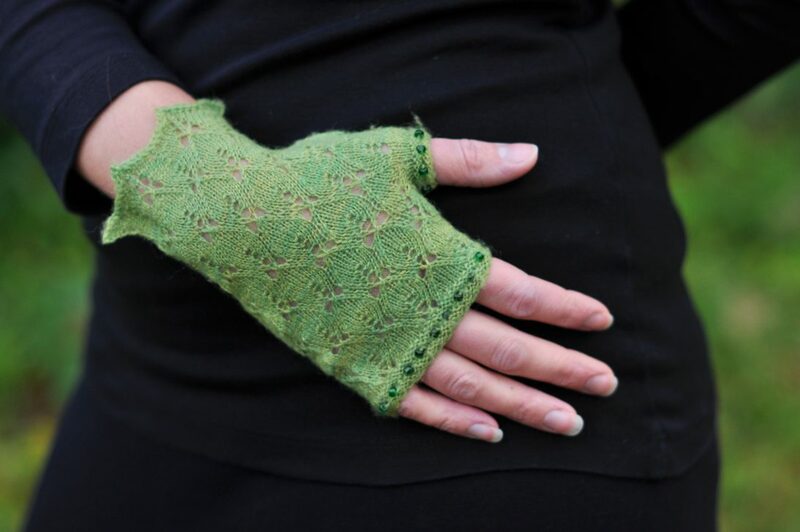 These feminine leafy lace gloves feature beaded edgings at the finger and thumb cuffs and pointed scalloped edging at the wrist. They make an ideal accessory for cool days, and for weddings. The pattern includes full written instructions and lace charts, and a clearly illustrated tutorial for the crochet provisional cast-on technique. One size fits all. Each blocked mitt measures 15cm/6″ in circumference at the palm, and is 18cm/7″ long. They are very stretchy! Approximately 25–30g/220–260 metres/ 240–290 yards of 2ply laceweight wool with approximately 875m/950 yards per 100g. 56 size 6/0 seed beads. 2mm/US 0 needles for your preferred method of small diameter circular knitting. 48 stitches and 48 rounds per 10cm/4″ in lace pattern after blocking.